Back in January, I wrote an article about the "DIS" website. It is one of the best all-around sources for Walt Disney World information. A great compliment to the website is the eTicket application for the iPhone, which is run by the people at the DIS. It is a very powerful research planning tool as well as a perfect trip companion. The first question many people may have regarding the app is "Where does the name 'eTicket' come from?" When Walt Disney World first opened in 1971, there was a completely different ticketing system than they have today. For much of the first decade, they used a ticket book system where each attraction required an individual ticket. There was a very small admission price to get into the Magic Kingdom and then there were five categories of attractions, each with a different ticket value. These attractions were labeled A, B, C, D, or E with the E ticket attractions being the largest and most popular. Examples of these attractions were Space Mountain and the Haunted Mansion. The term E ticket attraction is still unofficially used today when describing the best that Walt Disney World has to offer. In my opinion, the best area of the eTicket app is the map section. It is a completely interactive series of maps that cover all of the parks as well as the resort hotels and Downtown Disney. 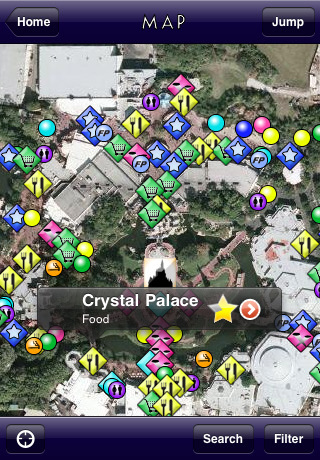 Each map shows you a satellite view with icons representing the attractions, restaurants, shops and even restroom locations. When you tap on an icon you find comprehensive information including pictures. It is fully integrated into the iPhone's gps so when you are on vacation, it actually puts "you" on the map. This is a really handy feature, especially when you are looking for the nearest restroom! In addition to the map section, the eTicket app also has a "browse" section that allows you to look up information in a category format as opposed to having to find it on the map. You can get short descriptions as well as reviews of the attractions, restaurants, and shops. Following the browse section, you will find a tab labeled "park hours." Here you can get all of the park hours for the next 30 days, including the extra magic hours. The fourth area of the app is the "My Itinerary" section which allows you to input specific info about your trip, such as hotel reservations and flight numbers. The final two sections of the eTicket app are for specific groups of people. First, the "Disboards" section is a link that takes you to the forums area of the DIS website. This is a great place to chat with other Disney fans about all things regarding the vacation kingdom. It is also a great place to post a question about trip planning, as you will surely find someone with the answer. You need to register for the Disboards, but it doesn't cost anything to join. 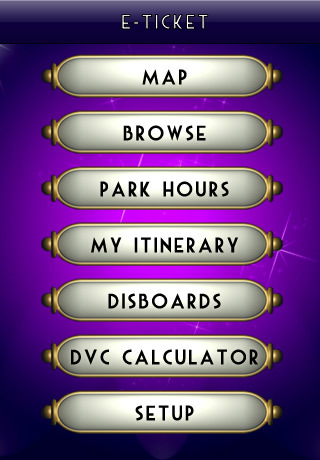 Finally, the last area of the eTicket app is for Disney Vacation Club members. It is a "DVC Points Calculator" that allows members to find out exactly how many points are necessary to book a specific resort on a specific date. As a DVC member, I find this to be a handy tool. The eTicket app is available in the iTunes store for both Walt Disney World and Disneyland. The cost for each is $5.99. I recommend the app to anyone planning a Disney vacation to either coast. The creators of this app mapped over 3,000 locations throughout the two resorts. It is certainly worth the $5.99 for the map sections alone!